Forty three OGAE clubs from all over the world voted for their Eurovision 2016 favourites and the results are in. With the last points coming from Andorra, Austria, Azerbaijan, Germany (EC), Sweden and United Kingdom, France’s Amir is the winner. A total of 3,336 OGAE members cast their votes, with “J’ai Cherché” receiving the maximum douze points from 18 of the 43 voting clubs. He walks away with 425 points. Things are looking good for Amir. The Wiwi Jury ranked him second awarding him a score of 8.59, while he’s also doing well in our polls. Russia’s Sergey Lazarev is the bookies’ favourite to win and he’s also riding high with the OGAE fans. He was the favourite with 15 clubs, and finishes second in the overall poll. With 392 points he comfortably beats third place Australia. Bulgaria and Italy round out the top five. 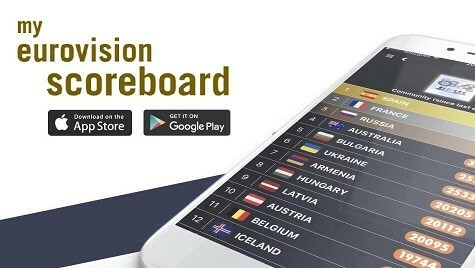 Only three countries — Montenegro, Russia and Serbia — left Australia out of their top ten. Bulgaria finished fourth with 175 points and Italy is not far behind with 170 points. Follow all our France Eurovision 2016 news. thank you for the information. gives me something to think about. yes, you did 🙂 I’ll leave my name w/o surname to keep it simple and to keep neighbors drama free. still, I don’t feel confident about OGAE results at all. maybe they are inaccurate in less %% than I calculated, but still there’s something that bugs me. do you know by any chance, how they gather votes? is it some group in social network where everyone can vote or it’s few internally selected members who vote? If it’s social network, can someone from outside go and vote to distort the picture? what do you think? Oxana :- That’s better, so that’s your real name and Oxyk is your nickname. Of course you don’t have to use your real name, I was just interested what Oxyk meant and what your name was. Not sure why people do not use their names?!?! Now I know who I am talking to. Hope i answered your query anyway? @georgekirkas we ALL understand you don’t like France and Russia’s songs but it’s not Eurovision GeorgeKirkas Contest! Everyone has his favorites even if you don’t agree with that! I agree with @Eugene! OGAE is just giving their top like everyone does on YouTube ! We will see during the semifinals and pretty sure that the final show will be TOTALLY AMAZING this year with such goods songs! what do you mean? I have to use my real name in posts or something else? I have classic Ukrainian name and it won’t be easier to quote than my nickname. this is no mean messages play against Amir just because he is part of the favorites ! be a little fair play ! it’s not because your favorite is not ranked high with bookmakers or OGAE need to go after him. Personally I don’t like the Russian song that I find very old and soulless but I will not criticize it as soon as it is an article ! French music is positive, current , solar ! I really hope that after 40 years without victory, France will finally win! No, i’m from Poland. But i support him with all my heart. Banal voice? OMG. I’ve heard his performances in Rising Star and all pre-Eurovision events and i was impressed. Hovi has a huge talent – it’s a gift from God! And I think the Dutch will do better at ESC than they did here. Last year, Aminata from Latvia got nothing from OGAE, but finished 6th in Vienna. The others who didn’t get a point look like a who’s-who of almost-certain non-qualifiers, and 0 for the U.K. doesn’t help their chances of avoiding a possible last-place Grand Final showing. @oxyk: The distribution of the points at the top of last year’s ESC was almost as enormous. The top 6 scored 67% of all the available points in Vienna. That’s why we had 4 countries score less than 10 points, 2 of which (AUT, GER) came away empty. is that fake? 🙁 i haven’t something with france!Amir has a very god song but MY winner is SERGEY LAZAREV!I want him to win! Never took these OGAE or OGAY clubs that seriously … but the fact that the majority has been able to understand what great music and real talent and pure musical intention in an Eurovision participation really are, deserves from me a ..
“74% of all the points went to the Top 8 countries” – this is exactly my point! clubs over the world have to be more diverse in their favs, unlike they are just copy what they told to copy. and this situation is dangerous and ruin the contest fair results. can you say who forms the people’s opinion? mass media and clubs who share their “ratings” to local communities in every country. now their control part of voters voices because most people will like what they see approved. the same goes for bookies. The OGAE clubs together choose the wrong winner and i am serious.It will Russia,because it’s has a amazing,awesome and great rehearsal-performance and staging.The song is the same 3 things too. So there are high chances that the winner will be one of the top 5 countries: France, Russia, Australia, Bulgaria or Italy. I’d say Russia (please no!!) or France (yeah!!). Australia will likely flop. I shame over my land, Sweden who hive Russia 12 point. Can you please check your article which talks about Ovidiu Anton who was going to represent Romania in Eurovision this year on the forum? I want to share an experience with you. I think this is a pretty accurate ranking. People hating on OGAE just because their opinions don’t agree with their own are at the same time the saddest and funniest thing. The quality of the comments section has been on the low recently, I guess we all know which 3 or 4 people to thank for that. To Stephanie and all those who go crazy for France: have you anything else to say to support your opinion except for “Haters are gonna hate”? It’s a stupid phrase and when somebody uses it, it means that they don’t have anything smart to say. 12 points to France from Sweden. Haters gonna hate, I think Amir will do really well in Stockholm and I can’t wait to see his first rehearsal on Friday. Allez la France, onward and upward! France is going to win! not a very big margin between france and russia… so that’s good. there’s a chance russia will overtake france. If you don’t have anything to say, then don’t say anything at all! “You are so pathetic”… Ha ha! I think I have heard this phrase somewhere! Ha ha, you are so ridiculous! Dear, please stop sharing your highly ‘smart’ thoughts because reading them is a time wasting. You may gain success with such an overall attitude in a group of some really angry mad haters. Since you are really one of those. There was not a single word of you telling who is your favourite or smth like that. Just a constant annoying childish idea. I remember when Ogae favorite in 2011 was Hungary and in final Hungary finished on 22 place, or second place in 2013 was San Marino who flop in semi. Croatia got high points almost from every Ogae from balkan countries. Only 6 points was from Iceland, and Czech we all know that many Czech go to holiday in Croatia.